I gave a hint in my Amazon round up that I cut the cable cord. And, I assure you, it’s one of the best [financial] decisions I’ve made. I previously had cable with Cox (although I’ve had ATT, Dish, DirectTV, etc) and was paying over $100/month. In a monthly budget, that eats away–I was spending over $1200 in CABLE—freaking cable. So when I moved to Flip 3, I decided enough was enough. 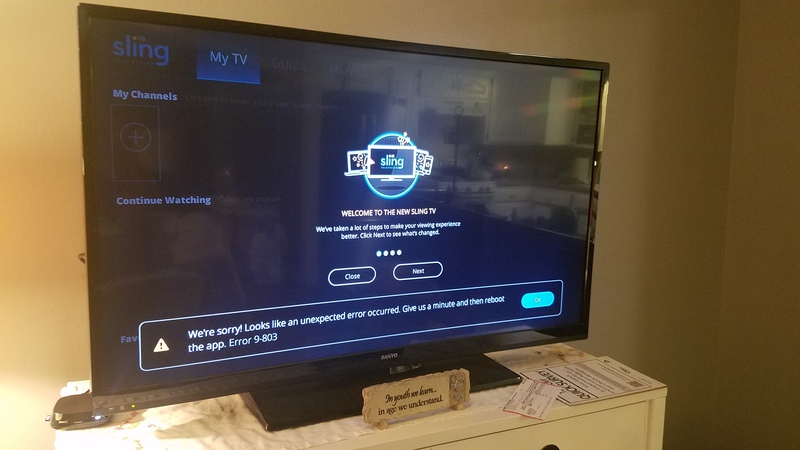 So I cut the cord! I debated my options and did some research by asking several friends. I was surprised to learn how many of my friends had also cut the cable cord. I opted not to use AppleTV because I’m one of the weird ones in my age group that does NOT like Apple. My brain never understands anything Apple, so I ended up choosing the Roku 2. There are different versions of the Roku, but based on the reviews and price, I knew the 2 was good for me. Roku is not like bunny ears. Roku is like the middle man between you and the shows you love. But there’s something remarkable about this middle man (as opposed to cable), you don’t have any monthly subscription costs (unless you opt for add-ons). 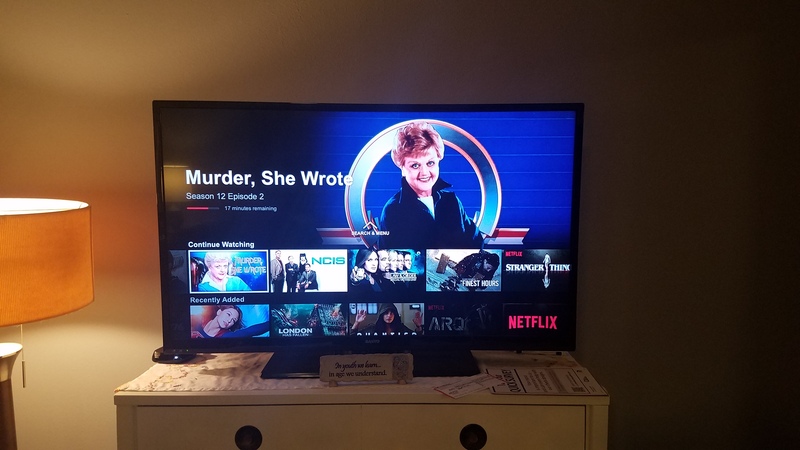 I paid around $70 for my Roku. Roku requires Internet, but, without cable, I would still have an Internet bill. I pay $40/month for Internet. 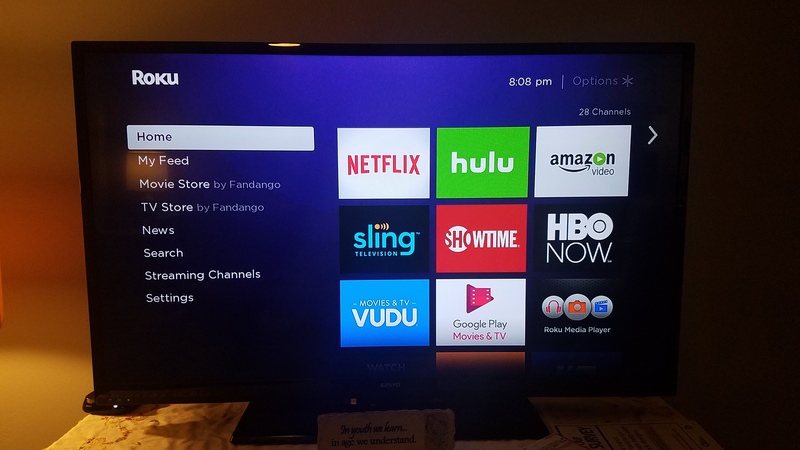 Without any add-ons, Roku comes with several standard channels. Some of them, I’ll say, I never use—the kid channels, HBO, etc. If you have a Hulu or Google Play, you can access more media through your accounts as well. The remote is a small little thing. It has direct Netflix (& others) buttons to skip going through menu. I lose this little remote a lot–it has a tendency to perfectly fit between the sofa cushions. On a pretty regular basis, they offer specials for temporary free access to certain channels. I don’t usually capitalize on those, especially for local channels. In addition to Roku, by using bunny-ears, I can easily access all of my local channels. But my all time favorite feature of Roku is Sling TV. This is one of the add-ons that is optional month to month. It’s around $20/month (depending on which package) for access to several cable channels- ESPN, HGTV, Food Network, Disney, CNN, etc. Like I mentioned in my previous post, I don’t keep my Sling TV subscription active all year long. During the fall–especially football season–I keep it active. I usually don’t have it on during the holidays or summer because I’m rarely home and there’s just reruns anyway. Even though I paid $70 for my Roku, there is a way to get one for free! If you pay for 3 months of Sling (basic $60 total), you get the Roku for free. That’s a good deal if you plan to keep Sling active the first few months you get Roku. Any of the Roku hyperlinks will take you directly to the Roku store. I remember when DVR came out and everyone said “It’ll change the way you watch TV.” The same is true for Roku! None of it is Live TV, so I can watch whenever- just like a DVR. I can pause and rewind, like DVR. But the best thing it has changed is my monthly budget! I don’t foresee ever returning to $100 cable bills. It got so bad with ATT that I actually bought myself out of the contract just so I could be done with their ever-rising bills & horrible customer service. With Roku, it’s cheaper, easier, and better! Good for you, we cut the Pay TV Cord like 13 years ago, think of how much money that is!! !, we have a Netflix Acct, and Amazon Prime, (mostly for shipping) but we really dont miss the TV Much, we have 3 Locals via antenna (plus the subchannels of each) but i get sooo much more work done with no TV Flipping, besides, you can pull almost anything you want off the internet these days, my guilty pleasure is Superstore, but thats on Broadcast so no big. What are you gona do with all that extra money? Probably for more projects on a flip! Do you know how it would work with multiple devices/watchers? Would I have to get one Roku for each device? How about Sling? Is that usable on multiple devices? Thanks, I’m trying to save on tv costs, esp while trying to update this 1972 house for my family. That’s a great question. I just have one device; however, I do know that Sling has the option to download the app to other devices. I THINK there’s a stick that works by plugging in to the computer–but I’m not sure and haven’t really researched that part yet.